History: Stella has been a patient at Wilston Vet since she was a wee puppy! Watching her grow up from a 9wk old puppy into the active and affectionate 10yr old dog she is today has been a wonderful journey. Recently, Stella became lame on her right hind leg. Given her age and very active nature, Dr Kate suspected that she had some arthritis or an acute soft tissue injury (such as a muscle or ligament tear or strain). Stella was started on anti-inflammatory and pain relief medication. However, her lameness persisted so Dr Kate decided to perform x-rays and manipulations of her leg under anaesthesia. 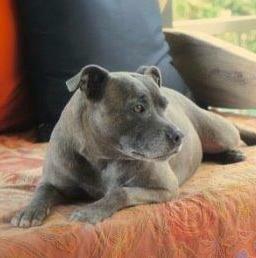 Examination: Stella was anaesthetised so that Dr Kate could assess her leg. Manipulations of all of her joints, especially her hips and knees, were performed by Dr Kate. An anaesthetic allows the veterinarian to perform the manipulations required without the influence of the patient’s muscle tone or resentment of the manipulation. Both of Stella’s cruciate ligaments in her knees were intact according to the manipulations. X-rays were performed on Stella’s knees and hips. 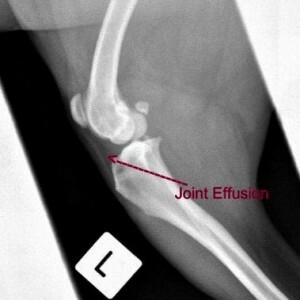 On the x-rays there was some evidence of mild arthritis and there was significant joint effusion in both knees. 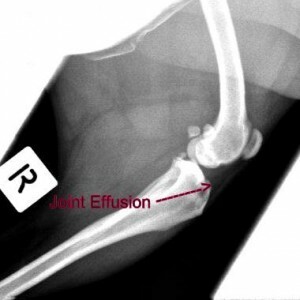 Joint effusion in the knees usually indicated trauma to the cruciate ligament that holds the knee firmly in place. Dr Kate decided that the next step was for Stella to be examined by our itinerate surgeon Dr Lyn Minhinnit, a veterinary surgeon whom has vast experience in orthopaedic surgery. Dr Lyn travelled to the clinic the following week and performed a complete orthopaedic examination of Stella. During this examination, and in combination with her xrays, she determined that Stella had partially ruptured her cruciate ligament in both knees. This explained why Stella’s symptoms persisted despite treatment, and why the ligaments appeared intact on manipulations under anaesthesia. 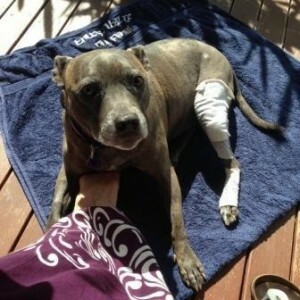 Treatment: Dr Lyn performed the orthopaedic surgery on both of Stella’s knees at Wilston Vet. 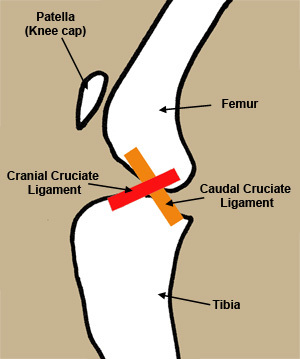 The surgery involved re-creating the cranial cruciate ligament with special suture material. During the surgery, Stella’s knee joints were explored surgically and damaged ligaments were removed. A thick nylon suture was placed across the outside of the joint. This is known as an ‘extracapsular repair’ or De Angelis technique. The nylon suture stabilises the joint and acts as a scaffold for fibrous tissue (scar tissue) to grow around it and eventually provides all of the stabilisation required for the knee to function. This technique is most frequently used in cats and smaller dogs (less than 20kg) but it can also be used successfully in large breed dogs. Stella went home that night with lots of pain relief, antibiotics, and a special bandage on each leg. Stella needed to be strictly rested and confined for 7 days, after which time her bandages would be removed and gentle exercise and massage was to start. Outcome- At Stella’s visit to Dr Kate 7 days after having surgery on both knees, she was already able to stand and move around ! Her owners continued Stella’s medication and exercise restriction program and Stella continued to improve. To assist in Stella’s complete recovery and return to normal activity, Stella visited a veterinary physiotherapist who performed special treatments and designed an exercise and home therapy program for her. Stella returned to the clinic recently for her 8 week post operative assessment. She has recovered incredibly well and is now moving about comfortably and freely without any sign of pain. Stella is a testament to the bravery and resilience of our canine patients, and the love and dedication of her owners.